What Are the Risks of Having a Mammogram Done? According to the Breast Cancer Surveillance Consortium, mammography correctly identifies approximately 84 percent of women who have cancer. Though these statistics indicate the results of a mammogram are typically reliable, there are still a few things your elderly loved one may want to consider before having this procedure done. No cancer-screening test, including a mammogram, is 100 percent accurate. A woman with an abnormal mammogram is subjected to the emotional and physical stress of follow-up testing and waiting for a diagnosis. This can be especially difficult for elderly women who have physical, cognitive, or sensory problems that make the uncertainty and additional testing particularly painful or frightening. 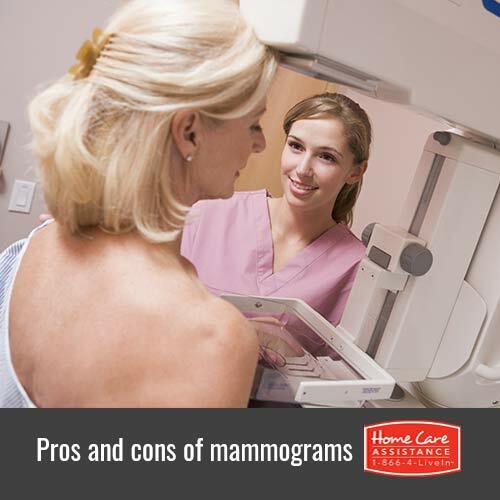 You should consider your loved one’s physical and mental state to determine if she can manage the stress of the initial mammogram as well as any follow-up procedures. If some form of breast cancer is discovered, it is likely surgery will follow. Since the elderly often have multiple health conditions, they are more susceptible to post-surgical complications from procedures such as biopsies and lumpectomies. In many cases, an elderly person never reaches his or her previous level of functioning after undergoing a surgical procedure. Of course, this depends in large part on your loved one’s current physical condition. A robust 80-year-old woman may recover just fine, whereas a frail 65-year-old may have more difficulty. Many of the breast cancers discovered during mammograms are caught in the early stages and are noninvasive. These cancers would not be expected to progress to the point of causing symptoms during the remaining lifespan of the typical senior woman. Depending on your loved one’s current health, it may be better to focus on her quality of life instead of subjecting her to grueling treatments that mostly likely will not extend life expectancy. Elderly women, especially those over 75, may actually have a higher risk of dying from a comorbid health condition than breast cancer. In fact, elderly women with 3 or more comorbid conditions, such as diabetes, respiratory disease, or a history of heart attacks or strokes, are 20 times more likely to die from that condition within 3 years than from breast cancer. This statistic is not affected by the stage of breast cancer at the time of diagnosis. Comorbid conditions can be more easily managed with the help of a live-in or hourly caregiver in Harrisburg. It’s up to you and your loved one to decide whether or not the risks outweigh the benefits. In the meantime, there are many other ways to help her remain healthy. Reach out to Home Care Assistance for more information on promoting senior health. Our caregivers are expertly trained, all of our senior care services come with a 100% satisfaction guarantee, and you’ll never be asked to sign a long-term contract. To learn more about the elder care Harrisburg families trust, call one of our qualified Care Managers at (717) 540-4663 to schedule a no-obligation consultation.